Titan Water Resistant Glossy White Inkjet Metalized Hub Printable 52X CDR-80 700mb - 50pk. 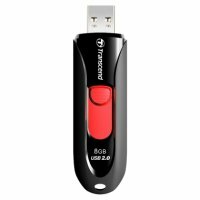 The convenient capless JetFlash 500 USB Flash Drive utilizes a retractable USB connector to shield your data while in transit. Simply push/pull the colored slider to expose/retract the connector. With Hi-Speed USB 2.0 transfer rates and extra large capacity, the JetFlash 500 makes it easier than ever to store, carry and share all your digital files wherever you go.